On January 29, 2019, thirty five people, including industry representatives, emergency managers, and first responders participated in the first of many activities slated for this year to help industry and communities develop effective emergency plans and keep first responders safe. This workshop was hosted in partnership with two other UT Institute for Public Service agencies: Municipal Technical Advisory Service and County Technical Assistance Service. In the morning session of this workshop, participants learned how to determine if they must file an EPCRA Tier II report, how to gather and organize the information and how to file accurately. Tier II reports are used by TEMA, county emergency managers, first responders, Local Emergency Planning Committees and others. The afternoon session of this workshop provided participants with a better understanding of the importance of the state management planning details and first responders need for accurate and timely Tier II data. 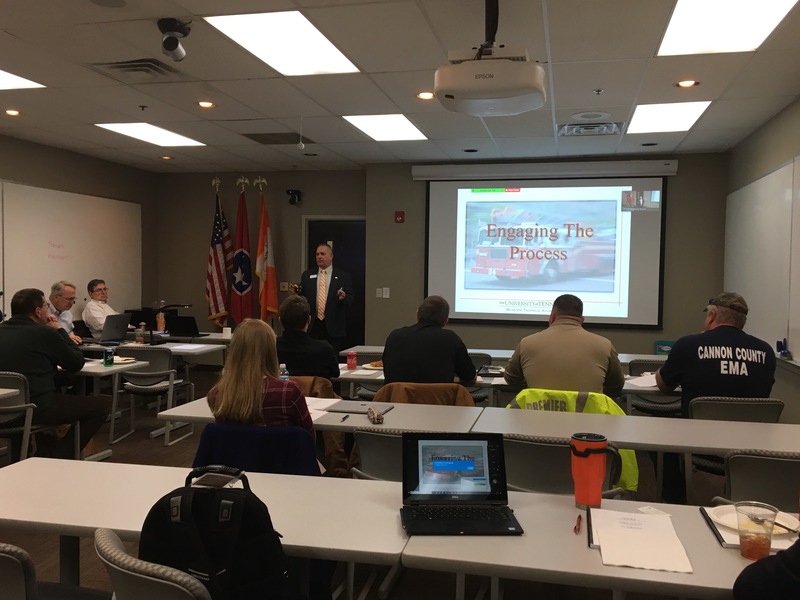 (Pictured above) Steve Cross, fire consultant with UT MTAS is talking to the group in the Center for Industrial Services’ Nashville office, plus 22 additional on-line participants, about the importance of having good industry EPCRA Tier II report data. Stay connected to us to learn more about upcoming 2019 events on this initiative.